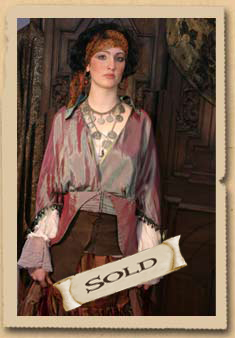 The Captain's Jacket, one-of-a-kind taffeta jacket is patterned on an antique jacket in our collection. Iridescent green taffeta lined in striped green silk with stand-up collar and underbelt that fits at the hip and closes with hooks and eyes. Beaded trim on the the bottom and sleeves.